Yay! I get to reveal the cover for Hallowed! I woke up this morning to discover that the cover had been loaded to Goodreads and was floating all over the web, which is kind of a bummer, since usually these cover reveals are a big deal and the publisher very carefully times when you can reveal them. :( No idea how it leaked out, but it leaked, so now I've been given the green light to show you all! Yay! I get to reveal the cover!!! Of course it will be all silvery and shiny like the UNEARTHLY cover was, so this image won't really do it justice. And it's blue this time. I will have to get me some blue sharpies. Mountains and lake in the background. Pretty cloudbursts. Pretty girl. Pretty swirly lettering with a feather. Oh, I forgot to add that this is only like 97% finalized. As this was revealed a bit too early. So there could be some changes. . . So pretty and it will look great next to Unearthly! It's beautiful! I can't wait to read it! It's beautiful! Can't wait to read it! Do you know what/when the Australian cover will be released? The cover is absolutely beautiful! 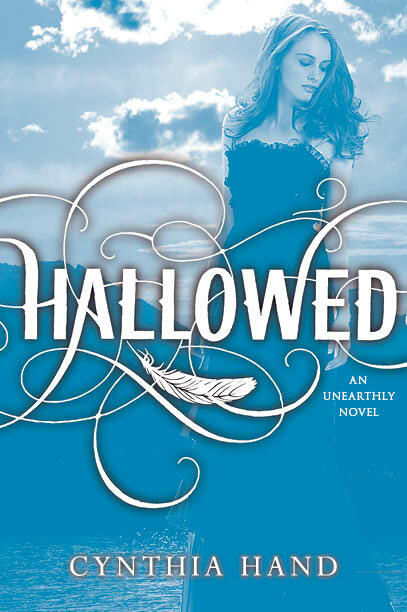 Hallowed's cover is stunning. I think that Unearthly and Hallowed look great side by side and I love the blue theme this time around! I can't wait to read Hallowed! I saw this first in The winter 2012 catalog which is on the publishers website, so that's how people got hold of it on Goodreads etc. Yep, it turned out that it was HARPER who leaked the cover. And by leaked, I mean it was on their Winter catalog site. *instantly forgives them, because, you know, I have to love Harper. They feed me. Absolutely gorgeous I can not wait to read it! I'm sure it will be just as wonderful as Unearthly! I was so happy to see the new catalog and see HALLOWED! I doubt I'll be lucky enough to score an ARC the second time around since I got one the first, but I'll be first in line to buy my copy. I can't wait to see how gorgeous the book looks in person. I remember being STUNNED at how amazing the final cover for UNEARTHLY turned out! It's soooo pretty! I love it when the books in a series fit together cover-wise! Oh my Cynthia, it's awesome!! I can't wait to have it sitting and matching perfectly on my shelf :). Beautiful. I need more Tucker. SaWoon. Hi do you know whatthe australian cover looks like yet? Thanks, Laura. Wow! I'm super excited to read this book, i like the fact that this cover matches the Unearthly cover, too. I'm on chapter 18 of the unearthly book, almost finished. Unearthly has got me more in to reading, can't wait till this 2nd book comes outtttt! I hope to find it in barns & noble as soon as it's released. Oh my god! I love the cover! I'm absolutely dying right now! I just finished Unearthly in a day because it was addicting! Seeing this cover made my week. I can't wait to have the book in my hands! Do you know what/when the Portuguese cover will be released?? OMG, I'm in love with this cover. Blue is my favorite color! I'm SO excited to read it! !